The DE-9 connector is the most common serial connector. This connector is found on National Instrument’s one and two port serial interfaces. To perform a loopback test with no hardware flow control, you will need to connect pins 2 and 3 for RS-232 and pins 4 to 8 and 5 to 9 for RS-422/485. These connections can be seen in redbelow (figure 2 for RS-232 and figure 3 for RS-422/485). When using hardware flow control, you will need to connect pins 4 to 6 and 7 to 8 for RS-232. 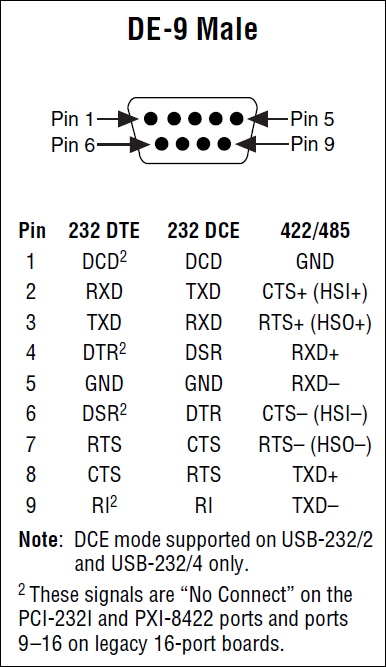 Pins 7 and 8 are used for RTS/CTS hardware flow control where pins 4 and 6 are used for DTR/DSR hardware flow control. For RS-422/485, you will need to connect pins 2 to 3 and 6 to 7. Both of these connections are required for RTS/CTS hardware flow control since RS-422/485 have differential connections. These connections can be seen in blue below (figure 2 for RS-232 and figure 3 for RS-422/485). This connector is not as common as the DE-9 connector. This connector can still be used to perform a loopback test with a method similar to the one used for the DE-9 connector. Most of the pins on DB-25 connectors are not connected since only nine pins are used for RS-232, RS-422, and RS-485 communication. To perform a loopback test with no hardware flow control with a DB-25 connector, connect pins 2 to 3 for RS-232. For RS-422/485 connect pins 5 to 20 and 7 to 22. The required connections can be seen in red on figures 5 and 6. For hardware flow control using RS-232, pins 4 and 5 must be connected along with pins 6 and 20. When using RS-422/485, pin 5 must connect to pin 20 and pin 7 must connect to pin 22. This will allow the loopback test to use the proper flow control lines. These connections can be seen in blue on figures 5 and 6. This connector is most commonly found on National Instrument’s 4 port serial interfaces. The National Instrument 4 port serial interfaces come with 4 10P10C to DE-9 male converter cables. It is not recommended to use the 10P10C connector by itself to perform a loopback test due to the small separation between pins. Using a 10P10C to DE-9 connector (Part Number 192190-01), a looback test can be performed using the methods described above.